Ravnica: the metropolis of the Multiverse. Though the Guildpact spell has been broken, the ten guilds live on in this city-covered plane. Five of them lie within. Choose your allegiance carefully, Planeswalker. Return to Ravnica features 274 black-bordered cards, including randomly inserted premium versions of all cards in the set. The Return to Ravnica Core Set is available in booster packs, intro packs, and fat packs. 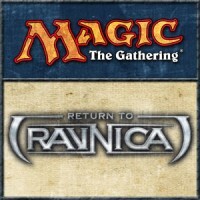 Add a Review for "Magic: The Gathering – Return to Ravnica"